I need to correct two mistakes from our last class, one which I made spontaneously, in our discussion, and therefore is recorded only on the audio recording and is not in the notes, and the other, which is a mistake in the notes themselves. At one point, we were discussing the theophanies of God in the Old Testament, and I was listing some of them, “off the top of my head,” so to speak, and I mentioned, quite out of carelessness, the great miracle at the dividing of the Red Sea. Well, of course, that was not a theophany in the sense that the Burning Bush, or God showing Himself to Moses during the forty days he spent on Mt. Sinai. It was a created effect, a miracle in the physical, material world. It is a “theophany” in the sense that all of God’ creations manifest – reveal – something about God, but not in the sense of a direct perception of the divine energies by a saint who is in a state of theosis. The other mistake was not accidental, due to my just rattling a “list” off spontaneously, but was due to a lack of a very important distinction in the notes. In the section on Nominalism, we discussed the true answer to the “problem of the universals,” which is called Moderate Realism. The lack of clarity in the notes gives rise to the mistaken notion that the universals – the shared natures of things of the same kind – are the same as the logoi, which are uncreated patterns of those things. But they are not the same. The universals are created natures. They really exist, and the mind can abstract from individual instances to perceive them, but they exist only in those individual instances. They are always “instantiated”; they don’t exist “out there somewhere.” We can perceive them, however, because our minds are created after the image of the divine Logos, in which – or, rather, in Whom – are all of the uncreated logoi, the divine patterns for all created natures. Our created minds perceive the created universals, because our minds are made after the image of the Uncreated Mind, as the universals are themselves made after the patterns of the uncreated logoi, which are energies, operations, of that Mind. A holy man who has arrived at the second stage of spiritual life, called theoria, begins also to see (which is what theorein means in Greek) the actual logoi, to perceive not simply the created natures but the divine meaning and purpose of those natures. I’m going to send out the revised Class 14 notes with the notes for tonight’s class. As we go along, I have to ask your patience with me for changing or correcting things now and then. Remember, I am another student learning with you; I am not a scholar with professional competence in any of the disciplines that apply to our study. I hope that our study together will inspire those who participate in our class, whether in person or long-distance, to read works by real historians and theologians who can explain these things with greater precision – and more authority – than I can. Here our purpose is to give an “amateur’s” overview of these very profound matters that form the content of our study. Our last class linked the High Middle Ages to the Renaissance by 1. Examining three mistakes of the Latin theology that made the Western church vulnerable to secular modes of thought and life, and 2. Examining the philosophical error of Nominalism, which changes man’s entire intellectual purpose from conforming his mind to the truth of the knowable natures of things to creating truth, or multiple truths, with his mind wandering in the endless examination and kaleidoscopically changing explanations of the practically infinite variety of individual phenomena. The transition from the Orthodox period to the High Medieval period marked a lowering from an Ideational culture dominated by the spiritual life to an Idealistic culture dominated by the intellectual, or psychic, life. The transition from the High Middle Ages to the Renaissance marked a lowering from an Idealistic culture dominated by the intellectual life to a Sensate culture dominated by the carnal and material. The movement can be summarized as a downward movement thus: Spirit > Soul >Body. The first step was the truly catastrophic one, marked by separation from God. The second step was bound to occur, because once man separates his mind from grace and from authentic spiritual experience, he cannot maintain the superiority of mind, of soul, over body, no matter how hard he tries. The ostensible cause for the Renaissance was the “rediscovery” of classical literature and the “rebirth” (thus “re-naissance”) of classical culture. But actually the new humanists mined the classical culture to give them ammunition in their revolt against the perfected God-centered worldview and complete wisdom of the Church. It was not a “return” to something higher, but a fall into something lower. The great minds of antiquity, leading up to the Birth of Christ, were looking forward to a revelation from the true God, to answer all of their unanswered questions, to give man a higher wisdom, which can only come from Above. God gave them the answer they were looking for, in Christ the Incarnate Wisdom of God. By going back and “reinventing the wheel,” returning to the “quest” of the pre-Christian thinkers, the Renaissance humanists are not gaining but losing wisdom. When we say that Renaissance culture is neopagan, humanistic, man-centered, secular, carnal, etc, this is not to say that the Church or Christianity somehow disappeared. Some form of the outward historical, institutional church remains a dominant, or the dominant influence in all the Western European nations, and even after the Protestant Revolt against Rome, the papal church remains the central institution in “papist” countries and some form of national church remains in the Protestant countries. Just about everyone in these countries regards himself as a Christian, including the leading thinkers, artists, politicians, and businessmen. But at the same time there are enormous changes in philosophy, science, politics, economics, and art that create a Sensate culture that is Christian in name but worldly in its content. The elites, who set the pace for the rest of their national populations, are rushing headlong into all kinds of experimentation and innovation, and this comes into dynamic conflict, often, with church authority and with the simpler, believing people. But eventually the innovations win out, because there is no longer either the anchor in the true Faith or the unity of an integrated culture, for among the essential characteristics of Sensate culture are fragmentation and instability, as more and more disparate experiments in “creativity” multiply. So with the Renaissance, Europe starts to lead a “double life,” Christian in identity but increasingly humanistic and pagan in its content, especially as lived by the elites – the nobility, clergy, intellectuals, and artists – and the growing merchant class, who gradually become part of the elites on the basis of their financial power. The tensions created by this double identity finally cannot be endured, and ultimately they give way to open Revolution against the Christian order of life, starting in 1789. We shall organize our discussion of the Renaissance around the themes we find in the notes from Fr. Seraphim’s lectures – Fame, Superstition, the Protestant Reformation including Chiliasm), Science (including the “Copernican Revolution”), and Art – as well as some further topics I believe we need to round out our study: Politics and Economics. This is the age when the center of man’s attention shifted from God to man, the age of Humanism. The motto of the Renaissance can be said to be that “man is the measure of all things.” What this meant, in real life, was that the ego is the center of everything, that a “great man” becomes great through achieving human fame. Fr. Seraphim quotes at length from a 19th century book on the Renaissance, by Jacob Burkhardt (see the second page of Lecture 3), in which the author dedicates a chapter to this subject of the modern idea of fame, which first arises in the Renaissance. Even Dante, who is thought of as the pre-eminent Christian poet, is said by Burkhardt to have striven “…for the poet’s garland with all the power of his soul. As a publicist and man of letters, he laid stress on the fact that what he did was new, and that he wished not only to be, but to be esteemed the first in his own walks.” Fr. Seraphim also quotes Burkhardt referring to another poet, Mussatus, who was “crowned poet” at Padua by the bishop (! ), and who was “venerated” with a solemn procession on Christmas Day! This, of course, is just idolatry. It is obviously a precursor of the idolization of celebrities in our own time, a profoundly anti-Christian phenomenon. Burkhardt, who was an agnostic, even says that there is something “demonic” about the lust for fame we see in political rivals of this time, who will do anything to make a name for themselves, even murder, because they are consumed by their passions. Of course, there have always been ambitious men who will commit sins to gain power. But in the Renaissance, we see the lust for glory and fame to be a dominant theme. The Renaissance is not some great age of “reason” after the “darkness” of an Age of Faith. The Middle Ages, so called, were the age of faith and reason. The Renaissance marks a tremendous turn to occultism, magic, astrology, alchemy, and superstition. This is the age of Nostradamus the astrological “prophet” and Paracelsus the alchemist, and of the eclecticism of Pico della Mirandola, who wanted to combine Christianity, Kabbalah, Platonism, and a whole host of contrary ideas and systems, including Magic, into some kind of universal religion. Really, it’s a time of Anything Goes. Part of that “bifurcation” I mentioned earlier is that even (or especially!) the popes of this period often believed in astrology. Burkhardt, quoted by Fr. Seraphim, states that Julius II had the day for his coronation set by astrologers, that Leo X thought the flourishing state of astrology in his time to be a credit his pontificate, and that Paul III never held a consistory (meeting of the cardinals) without consulting his astrologers! There is a great deal of neo-paganism and occult practice going on behind the scenes among the highest church officials at this time. This is part of the cause of the great revolt against Rome called the Protestant Reformation. While the Protestant Reformers claimed that they wanted to “go back to the Bible” and create a purified Christianity, they themselves were typical of this age, in that they too stressed individualism – every believer with his own Bible deciding for himself what it meant. Of course, this led to the Protestant movement splitting into innumerable sects and the old unity of Christian Europe being shattered into many warring states in endless religious wars. Again, we see here characteristic traits of modernity: innovation, fragmentation, and instability. Fr. Seraphim’s notes go on at great length about some of the strangest manifestations of Protestantism, the chiliastic “kingdoms” set up by antichrist “messiah” figures who claimed to be setting up the Kingdom of God on earth, a “Reign of the Saints,” and who used terroristic methods of mass murder, confiscation of private property, etc. to achieve their ends. Fr. 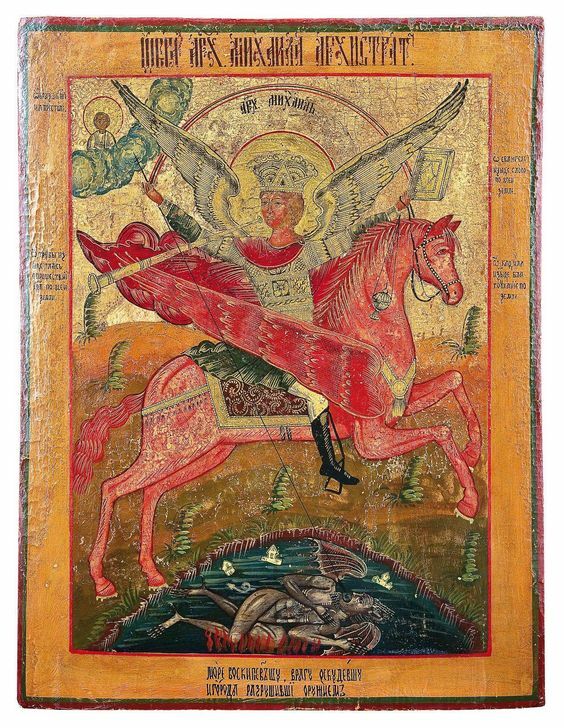 Seraphim is very concerned about chiliasm, because he rightly sees this as a key element of the spirit of our own times, which produced the “Soviet Paradise,” the “Thousand Year Reich,” and so forth, which are actually just preludes to something more horrible, the World Government of the Antichrist. The Roman church reacted against the Reformation by cleaning their own house, so to speak. There were better, more sincere popes in the later 16th and early 17th centuries, and they tightened discipline, reined in the worst corruptions of the sale of indulgences and so forth. At the Council of Trent (1545-1563), they laid the groundwork for what came to be known as the “Tridentine Church” which lasted until the present post-Vatican II period. (But even this council was presided over by the superstitious Pope Paul III who consulted astrologers!). This period of the papal church is marked by extreme centralization of power and the zenith of the efficiency of church organization, which had always been a strong point of the Roman papacy. There was, of course, no return to Orthodoxy, but rather a hardening of the papal ideology in reaction to the chaos of Protestantism. In our next class, we are going to discuss Science and Art in this period.